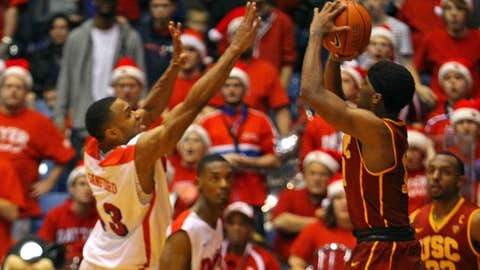 Southern California Trojans guard Pe'Shon Howard shot a buzzer beater three to defeat the Dayton Flyers in OT. DAYTON, Ohio (AP) — Pe’Shon Howard hit an off-balance 3-pointer from the right wing as time expired to lift Southern California to a 79-76 overtime victory over Dayton on Sunday. After Dayton’s Devin Oliver had missed a reverse layup with the score tied at 76, USC (8-4) got the rebound and called time out with 4.7 seconds left. Howard took the inbounds pass, dribbled up the right side and let his shot fly over Dayton’s Vee Sanford for the win. 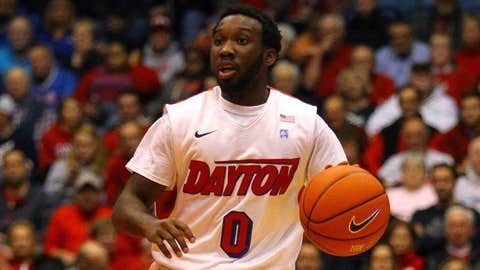 Dayton (9-3) took the lead twice in overtime on 3-pointers by Jordan Sibert. The Trojans responded with two free throws and a 3-pointer by Howard to lead 76-75. Oliver tied the score with a free throw. Julian Jacobs missed on a drive with 35 seconds left to set up Dayton’s chance to win in the final seconds. Howard finished with 12 points, and backcourt mate Byron Wesley scored 26. Wesley, the Trojans’ leading scorer, came off the bench for the second straight game. Wesley tied at 67 in regulation with a driving shot in the lane with 1:45 remaining. Dayton regained the lead on two Jalen Robinson free throws with 50 seconds left. But Wesley came back with a driving layup to tie the game again at 69. Dayton held for the final shot, but Khari Price missed a 3-pointer from the left corner. Sibert led Dayton with 21 points and five 3-pointers. Dyshawn Pierre worked inside against the much taller Trojans for 16 points. Dayton threatened to put USC away in the first half with a 21-12 lead and USC big men Omar Oraby, a 7-foot-2 center, and Nikola Jovanovic, a 6-10 forward, on the bench with two fouls. But the Trojans rallied behind 7-foot backup D.J. Haley. Haley scored seven points and capped a 14-4 run with a tip-in to put the Trojans up 26-25 with 3:58 left in the first half. Dayton responded with a 12-6 run to take a 37-32 halftime lead. On the last play of the first half, Dayton inbounded from the baseline with .4 left and scored. Pierre caught a pass on the right wing just inside the 3-point line and pushed it right back toward the basket for two. The officials reviewed the play and counted the basket. USC improved to 3-12 in its last 15 non-conference road games. The Trojans were coming off a 72-71 loss at Long Beach State on Thursday in which the 49ers snapped a nine-game losing streak. The Trojans erased a 16-point deficit in the second half to take the lead, but the 49ers scored with 16 seconds left to regain the lead. Wesley missed a jumper at the buzzer. Wesley, who averages 15.9 points per game, was a late scratch from the starting lineup against Long Beach State. He scored two points in 21 minutes. He did not start against Dayton but entered the game early and scored 15 points in the first half.